American DJ LED Pixel 10C DJParts - All Variety of Parts that DJ Needs. 10-Channel Driver/Controller for LED Pixel Tube 360 • Great for the Musician or DJ that wants manual control of his light show • Linkable via 3-pin XLR cable In/Out to other LED Pixel 10C • 24 built-in programs • 4 DMX Channel Modes (5, 7, 32 & 480 Ch.) 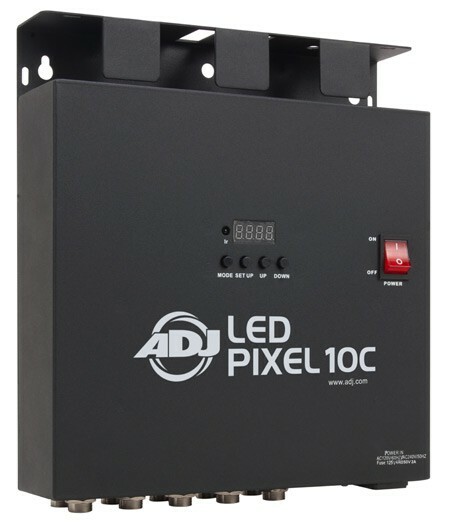 • Sound Active • DMX-512 Protocol • Electronic Dimming: 0 - 100% • 4-button LED display • Built-in, reversible, hanging/truss bracket • Compatible with ADJ LED RC wireless remote control (sold separately) • IEC AC Power In/Out on rear to daisy chain power (Power connect up to 3 LED Pixel 10C) • Power Draw: 200W max • Multi-voltage Operation: AC 120 or 240V, 50/60Hz • Dimensions (LxWxH): 12.75” x 11.25” x 3.25” / 318 x 280 x 80mm • Weight: 10 lbs. / 4.2 kg.